The store also resonators quartz watch and an AVR programmer. 1. Reset mikrokontrolerach AVR internally pulled up to VCC. The manufacturer in the technical note, however, it is recommended to attach an external resistor pull-up if the system is exposed to interference. We recommend you to add an external 10k Ohm resistor. 2. Converter analog-to-digital has a separate power pins. 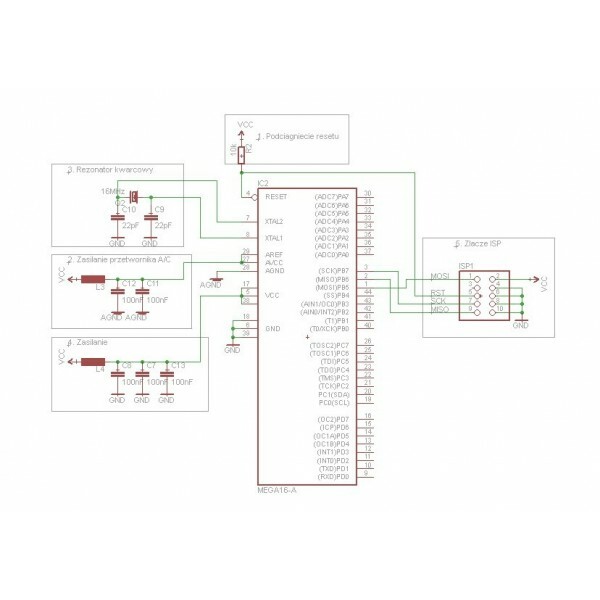 The manufacturer recommends a dedicated power line (via the oil seal around 10uH) and mass (weight analog and digital must be connected at one point of the PCB) to reduce interference. This will allow to obtain higher precision of the Converter. 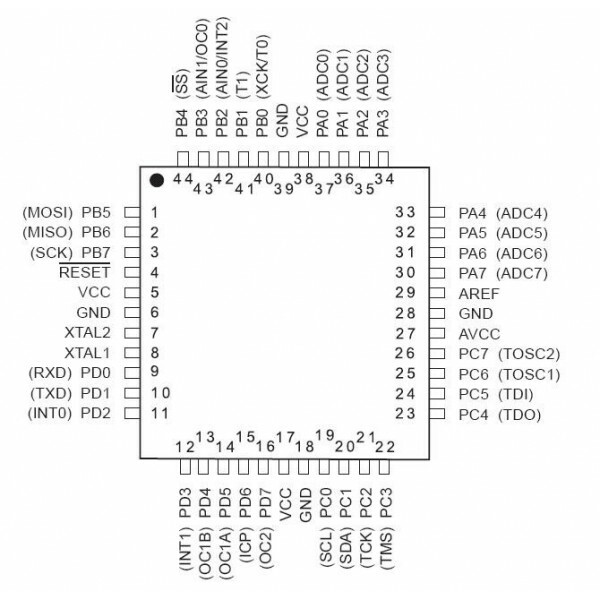 If the maximum resolution which offers Atmel (10bit), we do not need, it is not that we should lead the way. Pin AREF voltage reference for the sensor. Agrat give the opportunity of choosing the internal voltage reference. If we decide on such AREF should be connected via a 100nF capacitor to ground. The inductor and capacitors form a LC filter. Without applying these elements will also lose accuracy A/C. warning! 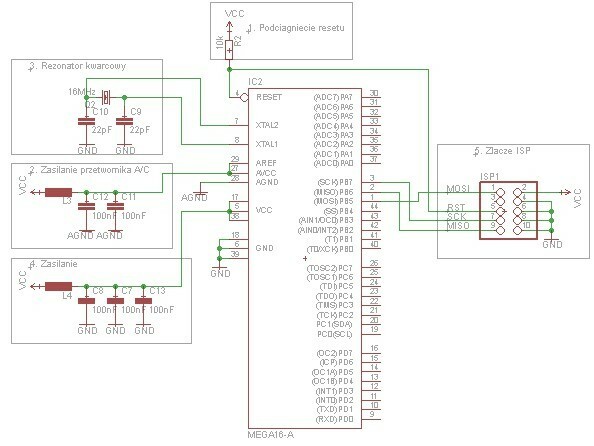 even if the Converter is not used, connect the AVCC and AGND pins, because they are also food for PORTC. 5. 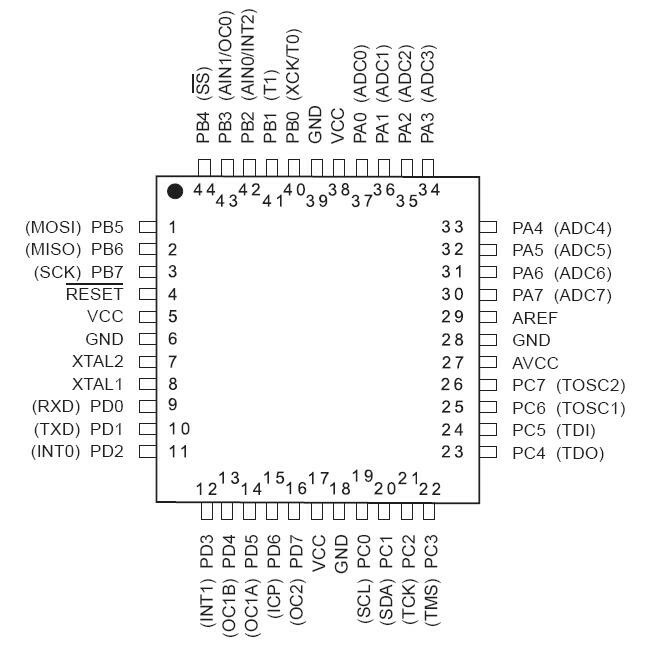 The maximum clock frequency of this microcontroller is 16MHz. The values of the capacitors specified by the manufacturer in the documentation. In the example, for quartz 16MHz 22pF we. 4. Food. For each pair VCC-GND, the manufacturer recommends a 100nF capacitor. In addition, it is also desirable use of the throttle. However, from experience we know that Agrat are working fine without this element. Of course, it all depends on the environment in which they work. If there is space on the PCB is this the throttle to apply, for advice. 5. Connector ISP (In-System Programming) allows programming of the microcontroller, located on the target system. 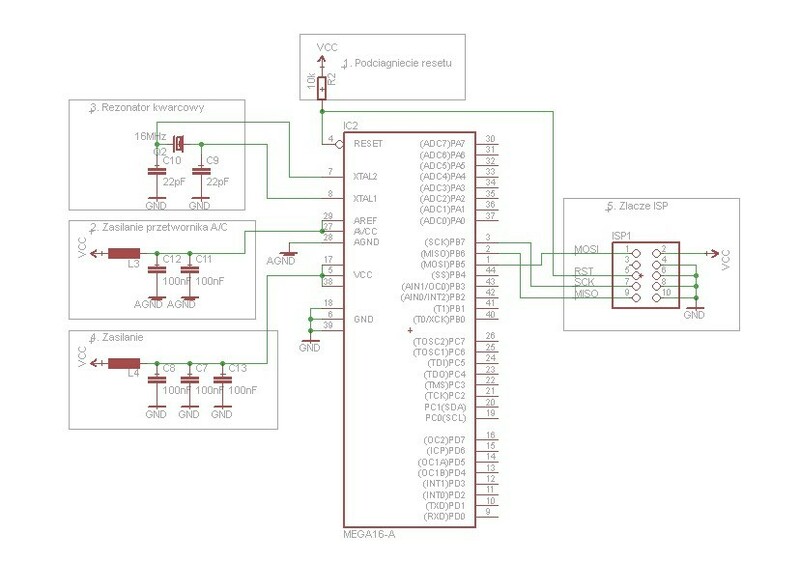 Use the SPI interface. Documentation from the site of Atmel. Symbol: JHD162A B-W. Driver compatible with HD44780 . Blue negative. Backlight: white LEDs. Character color: white. Support the soldering iron capacity 25W fed by a mains voltage of 230 V. ideal for soldering or rozlutowywania simple, small electronic components.